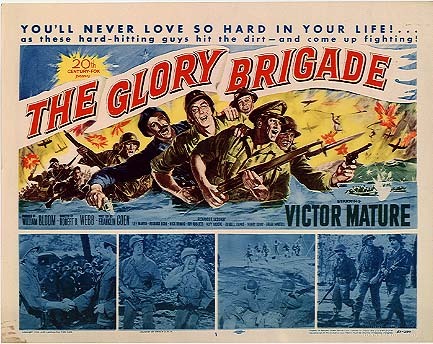 THE GLORY BRIGADE—-the Defense Department threw a lot of vehicles into this 1953 Korean War snooze, pushing the theme of International Burden Shouldering (paging the U.N) with G.I.’s, led by Victor Mature, reluctantly fighting alongside Greek troops. Richard Egan, Lee Marvin and Alvy Moore (‘Mr. Kimball’ from Green Acres) share the burden of the script. Directed by Robert D. Webb, the 82 minutes are unexciting, unrealistic, pretty much ‘un’. Filmed for a trim $850,000, giving some work to Nick Dennis, Alexander Scourby, Henry Kulky and Roy Roberts. This movie mission took hostile fire and reported a shamefaced #141 of the years releases. You’ll never love so hard?